View bonsai currently on display at the Bonsai Pavilion. See the Safari Park's website for park hours and admission information. Self-guided information is available in the kiosk inside the Pavilion. Volunteers from San Diego Bonsai Club and San Pu Kai are available to answer questions at the Bonsai Pavilion on the 1st and 3rd Saturday of every month from 9AM to noon. John Jackson is the Pavilion curator and Dennis Wagner is the assistant curator. 'Lyn Stevenson is the Pavilion liaison. Use the contact page to contact John, Dennis, or 'lyn. Over 25 years ago, The San Diego Zoological Society provided land for the Bonsai Pavilion at the Wild Animal Park. 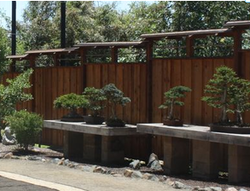 The Bonsai Pavilion was initially constructed through joint efforts of The Wild Animal Park and volunteer members of the San Diego Bonsai Club and San Pu Kai over a two-year period. World Bonsai Master, John Yoshio Naka, was one of the first to recognize the value of having a bonsai collection in Southern California. The Pavilion was opened on May 9, 1987 coinciding with The Wild Animal Park's 15th anniversary celebration. John Y. Naka cut the ribbon for the first and largest permanent bonsai display facility in the western United States. Major monetary contributions were given by the Golden State Bonsai Federation, San Diego Bonsai Club, and San Pu Kai along with many bonsai enthusiasts throughout California. On May 1, 2011, after several years of study and planning, a new Bonsai Pavilion was opened at The San Diego Zoo Safari Park (formerly The Wild Animal Park) above the first pavilion and four times larger. The new features included a waterfall, three bridges, and a meandering stream in a tranquil, secured setting. This allows for more bonsai exhibits as well as an expanded work area. The San Diego Bonsai Club honored its founder and early president Mas Takanashi with the construction of an impressive entrance gate incorporating the Club's logo in the design. The combined effort and financial assistance from the Club members, the Horticultural Department of the San Diego Zoo Safari Park, Bonsai Clubs, San Diego County grants, businesses, and friends throughout California have made this new addition of bonsai in Southern California a reality and a true bonsai treasure. Also, several memorial tributes have been made to honor deceased members and friends. Contributors in several categories are acknowledged on a beautiful Honor Donor Board at the entrance of the Pavilion which is located to the right of the Takanashi gate.